Teachers will be sending home with your kids a week ahead of the Book Fair a flyer that provides a preview of only a few of the many books available to purchase during the fair and an invitation to our MUFFINS & BOOKS WITH A LOVED ONE and another one to our HOT DOG SOCIAL & BOOK FAIR FAMILY NIGHT! The flyers include a special raffle ticket to enter to win the prizes below, so please bring your ticket to the event. Volunteers are needed, click here to sign up. Please note that you can only use this link on a computer, no mobile sign up. Thanks! You can now send your student to the fair without handling any cash! Scholastic Book Fairs is now offering an eWallet payment option. Just set up an account here and have funds immediately available for your child to shop at the Book Fair. This year, our "All for Books" school-wide collection will benefit all our kids as we will be using it to purchase lots of new books for our Library!! Our goal is to reach 100% parent participation, no amount is too large or too small! PLUS, the TOP TWO classrooms that collect the highest amount will receive a Pizza Day. SPECIAL EVENTS: YOU ARE INVITED! Breakfast and Books with a Loved One: on Monday, May 7th, from 7:20 - 8:20 am. children are invited to bring their grandparents, aunts/uncles, parents and other loved ones to have muffins, fruit, coffee and juice and shop at our Spring Book Fair! You could win an Electric S’mores Maker and $25 Amazon Gift Card. Hot Dog Social and Book Fair Family Night: on Tuesday, May 8th from 5:00 pm to 7:30 pm. It will be a fun night for all that includes Hot Dogs, photo booth, mystery readers, scavenger hunt, and fun raffles!! You could win a Chatty Charlie the Barkin’ Beagle $50 in books $25 for you and $25 for your classroom!! ENTER OUR BIG RAFFLE: Get a ticket for every $50 dollar you spend during the Book Fair for a chance to win the MiP the Toy Robot! Online Shopping Available: Our ONLINE FAIR is available for an extended time this year, starting on Thursday, May 2nd through the 20th, so you can buy your kids wish list if you can’t make it to the Book Fair, or share with Grandparents and any extended family. All orders will ship free to our school. Go to scholastic.com/bf/greenwichcatholicschool1 for a direct link to the online book fair once it starts! There will also be a classroom wish list at the book fair if you would like to grant a book wish to a class please check the display at the fair and you will get a ticket to win a Giant Stuffed Dog! 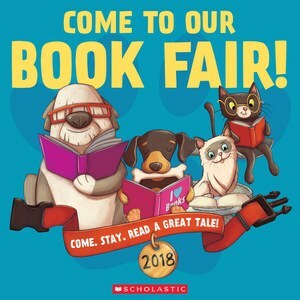 Don’t forget to mark the Book Fair dates on your calendar! We look forward to seeing you at our Scholastic Book Fair and thank you, in advance, for supporting this great literary fundraiser!